Pre workout for women, by Pure Fitness Nutrition, could have been something that was transported to 2013 through a time portal from the 80's. Or it could be the result of a high-schoolers marketing project. In either case- it may be the most primitive attempt at capturing a share of the women's pre workout market that we have ever seen here at BPW4W. It barely even made it to the testing stage for this years best pre workout for women 2013 bench tests. The only reason why we decided to give this product a shot was because we have been deceived before by products with unimpressive labels and websites. In other words, we know better than to judge a book by its cover! Cardio: Pre Workout for women is fairly unremarkable for cardio workouts. If there was any trace of increased performance- it would have been a very very slight mental or focus improvement, most likely due to the inclusion of N-Acetyl L-Cysteine and N-Acetyl L-Tyrosine. These specialized aminos are known to support adrenal function and therefore give a boost in energy. Many companies use them in conjunction with caffeine, so the the adrenal system is well supported. However, don't read too much into this- pre workout for women is almost un-noticable when you take it. We've totally been spoiled by the likes of Fitmiss Ignite, Unico Toned, and others, but if you name your product 'pre workout for women'; you're going to get compared to the big dogs in the category! Weights: Pure Fitness Nutrition may as well put a footnote on the label that says- 'this product is worthless for weight training'. The honesty may have raised the products meager 2.8 rating, which landed it second to last in this years BPW top 10. Just by looking at the supplement facts panel you can tell this is not a product that will do much for you if you're trying to get a good swell in. What little amount of active ingredients are included are the likes of caffeine and a few other meager nootropics (brain/energy/focus ingredients) that won't really support your strength or muscular endurance. There's no BCAA's, no creatine, no beta-alanine, and no reason to take this before a strength session. The decision was unanimous among testers who took the product prior to weight training- there is zero effect. Yoga: Here is a category where pre workout women has even a prayer at carving out a niche. Because of its nootropic profile, this product actually did ok prior to yoga workouts. The slight increase in focus and concentration is something that the testers agreed was a benefit in the studio. It allowed them to stay true to their form and maintain better posture during each pose. There is certainly something to be said for the benefit of the 'mind-muscle' connection- especially when talking about yoga workouts. It is an important part of this training style, and is supported quite nicely by pre workout for women by PFN. 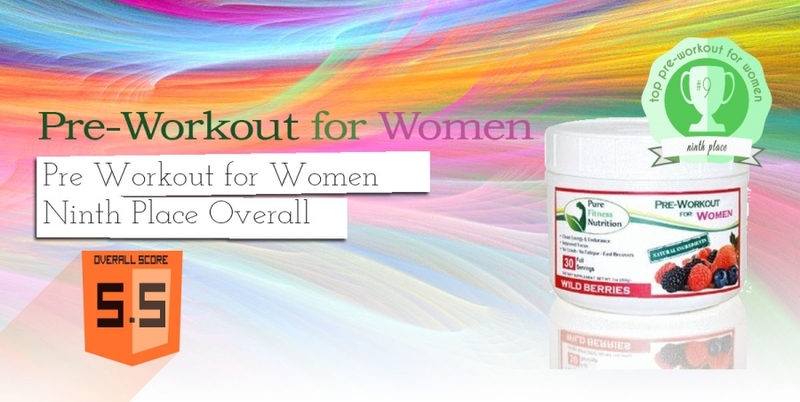 Those are the results of how pre workout for women performed across several different tests. Ok for cardio and yoa- not so good for the more physically demanding strength training or cross-fit style training. Any reader of this blog knows that after we give praise and finish the vanilla part of the review, we have to get down to the nitty-gritty and piont out any drawbacks to each product we test. Pre workout for women is basically filler. Take a quick peak at the supplement facts panel. The serving size is 7 grams. Now shoot on over to where the active ingredients, or the 'good stuff' is contained- usually that means you're looking for language that ends in 'blend'. (Unless it's toned). In this case its called 'natural energy blend. You can see that the size of this blend is just over '1000'. Now the first problem is that there are no units after this number- but we could assume that this means 1000 milligrams, seeing as the serving size is only 7 grams, which rules out the possibility of it meaniing 1000 'decigrams' (which no one uses anyways). So the blend weights in at just over a gram. Meaning that there are 6 other grams of what exactly? Looking at the measure of carbs- we can guess that the rest of the formula is mostly filler- like maltodextrin or 'rice hull' (which we've never seen before in a product). These fillers provide the carbs, and are the definition of empty calories. The fact that this formula is so poorly put together is the main reason why it performs so poorly, and why it landing near the bottom of our BPW4W top 10. If you're going to get a 'pre workout for women'- don't get 'pre workout for women'.